When you start your driving lessons you need a nurturing environment. There most definitely should be no yelling involved. Creating a learning environment like this starts with us and our instructors. To that end we never stop training our instructors to keep them on top of their game. Driving instruction is about listening and responding to your needs. Our instructors passion for driving is infectious and aimed at one thing. Bridging the gap and turning a nervous beginner into a safe, confident driver. This level of driving instruction is fantastic but we also feel that gaps between lessons can often slow progress so all our pupils also get free access to our online training platform to help reinforce their learning. We have seen students consistently progress faster with the use of our home study support material. Our extra bonus training will give you the head start all your EDT driving lessons, on road rules and on the driving test. No other Sheep's Head driving school offers such a comprehensive service as this. We all remember the fun engaging teacher in school that made learning fun and easy. And we can recall the lousy teachers that had no business teaching anyone. Not all teachers are made equal and that is certainly no less a fact with approved driving instructors. It is easy to Google 'Driving Lessons Sheep's Head' and find driving instructors near you but which can you trust to best teach you. Knowledge and professionalism is what you need from a driving school. A place where students are regularly passing their driving test first time. 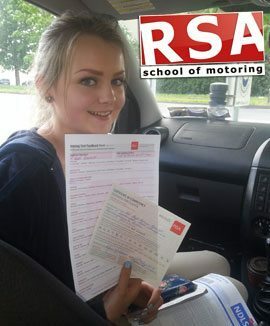 RSA School of Motoring have the exact track record of student success we have been talking about and we have the verified reviews to prove it. So if you need driving instruction you would be getting a head start choosing us. Let us show you why. Generally pupils are one of the following. You are either starting or need to complete your EDT driving lessons. Or you have completed your EDT and have a driving test to prepare for. It is an depressing fact that Ireland is one of the worst countries in Europe for road deaths and accidents. In an effort to stem these stats the Road Safety Authority introduced a new and mandatory training initiative for new drivers. The Essential Driver Training or EDT. Learning to drive safely means knowing and exercising particular driving skills and these 12 EDT lessons have been intended to do just that. There is learning the vital driving skills and developing your knowledge of road signs and road safety. And then there is learning to pass the driving test. Being allowed to drive by yourself on Sheep's Head roads is a privilege you must earn and the driving test is your opportunity to do it. And naturally, as with any test, if you understand the conditions and what to expect you can pass easily. If your test is booked there is a lot of unknowns and fears to contend with. Fear can distract even the most experienced of drivers. So it makes perfect sense that we have to shine a light in the dark, eliminate the unknowns and the fear. Which is precisely what our pretest driving lessons will do. We don’t like leaving things to chance. We simulate for you all 4 stages of the test, teach you all the test routes and focus on the areas of your driving that are most likely to get you the most marks or fail you. Using this method we get our student past the test in half the time it takes other driving school. Passing fast means you save money. We certainly do. And believe us for a young person that is dying to gain their independence there is no better gift. Change someones life today with a RSA School of Motoring Gift Voucher. What self respecting driving school doesn't offer automatic driving lessons in Sheep's Head? We can offer all our students driving lessons in automatic or manual dual controlled vehicles anywhere in Sheep's Head. Book your automatic driving lessons in Sheep's Head now. Do you want to do your Sheep's Head driving lessons with a lady instructor? Your wish is our command. You can take your essential driver training or pretest lessons with one of our female driving instructors. Just give us a call to book in. Yes. We aspire to make your driving lesson experience as convenient and easy as it can be. Which means we will come to your home or place of work* to start each driving lesson. We would be proud to help you learn to drive so give us a call now to discuss your driving lesson needs. You won't be disappointed.